© Copyright Dr. Velma Smith 2014. All rights reserved. Every once in a while formidable and exceptional talent impacts the gospel industry who leaves an indelible impression! The Ladies of God, a highly anointed gospel group, has done just that! When these enthusiastic musical virtuosos sing and/or rap they become vehicles through which the intent of worship and praise is fully recognized. Moreover, they emerge on the gospel scene as a resilient component for the 21st century. These worshippers extraordinaire perform with purpose, fervor, zeal and poetic eloquence which ushers their audience into the atmosphere of worship! God has magnificently blessed this group with an impressive creative edge. Their commanding vocal talent is at a level of achievement which is brilliantly demonstrated on their current project “All God His Glory” which features the remarkable singles “Thank God” and “Hallelujah.” What a supersized gift the Lord has given to the Kingdom of God! Their impeccable vocal artistry and talent continue to revolutionize the gospel music industry. Moreover, the group has provided inevitable proof of great talent and an even greater future. The vocals on “Thank God” illustrate the sheer depth and intensity of their stylistic diversity on the track. It is methodically done with the Vocal (Lady D), first and third verse (Lady J) and the second verse (Lady V) with everyone participating in the melodic Hook. Undeniably, their labor-intensive efforts on “Hallelujah” indicate the creative genius of the group. The Vocalist is (Lady D), half of the first verse is (Lady J), and the other half of the first verse is Lady V. In fact, audiences simply marvel at their ability to apply such personalized melodic/harmonic blends in their vocal delivery, which sounds like a multitude of voices. The Ladies of God gospel group is comprised of three enormously vibrant women of God. They are Jonita Johnson AKA Lady J, a native of West Monroe, Louisiana. Frances Daniels AKA Lady D, a native of St. Joseph, Louisiana. Valisha Washington Tolliver AKA Lady V, a native of Austin, Texas. Currently, they reside in Monroe, Louisiana. They are saved and filled with the Spirit of God! Their educational backgrounds exemplify their pursuit of excellence. Jonita Johnson AKA Lady J, received a Bachelor’s Degree in Accounting in December 2006. She is currently working on her Master’s Degree in Education at the University of Louisiana at Monroe. She is scheduled to graduate in August 2014. She also graduated from the Liberty School of Ministry and Bible Institute in May 2009. Frances Daniels AKA Lady D is currently working on her Bachelor’s Degree in Business Leadership. She is scheduled to graduate in May 2015. She also attends the Liberty School of Ministry and Bible Institute. She is scheduled to graduate in May 2015. Valisha Washington Tolliver AKA Lady V is currently attending the Liberty School of Ministry and Bible Institute. She is scheduled to graduate in May 2015. For music connoisseurs who want to savor the taste of the best of worship and gospel rap this project is what you have been waiting for! The project immediately establishes a dialogue with the melody and the lyrics. Such profoundness affirms an uplifting and liberating factor for the listening ear. The sheer depth and intensity of their stylistic diversity on this project simply raises the bar of excellence. The Ladies of God are members of the Liberty Christian Center under the leadership of Dr. Johnny and Pamela Drumgole. They are multi-faceted women of God — they are mothers, wives and they are all employed! Jonita is a teacher in the Monroe City School District, Frances is an Operations Associate for Chase and Valisha is a Real Estate agent for Keller Williams. Undeniably, this group consists of individuals who are keenly aware of their God-given purpose for the end times. Each member of the Ladies of God has been tried and proven. When the group encountered the evil works of the enemy’s road blocks, they continued to trust God to provide an expressway! God has never failed them yet! Thus, each one of them can testify with the utmost authenticity, that it is “All God His Glory” that they are ministering to! They are living the life and singing the story! This group is destined to do God’s work. Each of them was born with a keen melodic distinctive. Specifically, Valisha (Lady V) has been singing, dancing and performing since she was 7. Jonita (Lady J) has been writing and rapping since she was 9. She has done professional recording since she was 12. Frances (Lady D) has been anointed to sing and has been singing since she was 9. They are all infused with extraordinary vocal capabilities. Their repertoire is quite impressive. Lady J and Lady V were invited to perform by Big Al at the local skating ring where the multitudes of diverse backgrounds embraced their sound. However, God was not through with them yet. The missing component was a vocalist. After praying for a vocalist, God gave the vision, and Frances Daniels was brought on the scene. God fulfilled the vision and now the Ladies of God are doing His work. 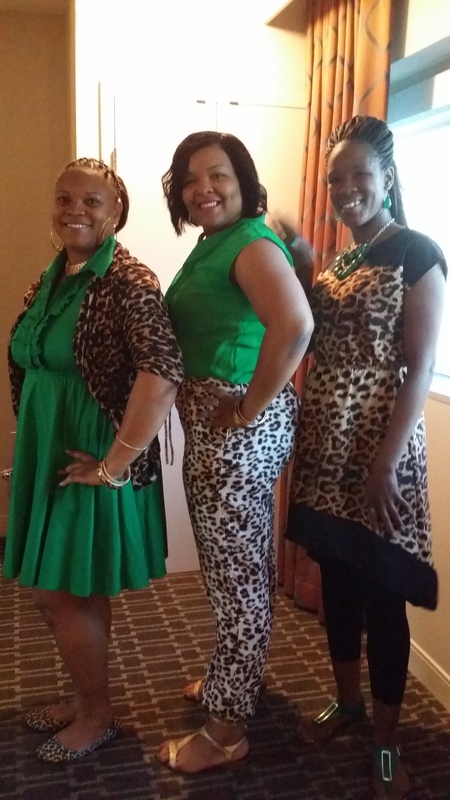 In April 2014, the Ladies of God performed at the National Association of Gospel Promoters and Managers (The NAGPM) in Atlanta, Georgia. They also gave a stellar performance at the Urban Soul Café in Knoxville, Tennessee. The Ladies of God are committed to trusting God as outlined in Proverbs 3:5-6 with their whole hearts. They are on one accord as they confer all the glory to God. Further, scriptural conviction for the group is established from Romans 12:1 as they present their bodies as a living sacrifice, holy and acceptable to God which is their reasonable service. The Ladies of God are just dynamic and pure energy! Their audiences simply marvel at their extraordinary vocal command which exudes a smooth sophistication, while simultaneously, displaying their ingenuity and versatility. The absolute caliber of their spectacular delivery on this project is quite compelling and distinctly captivating. Their vocal ranges incorporate melodic and harmonic elements that are soulful, quite impeccable and seriously developed. Ultimately, the Ladies of God encourage their audience to genuinely listen to the lyrics resulting in a very extraordinary worship experience. At the end of the day, they desire to see change throughout the world by the power and authority of Jesus Christ. The Ladies of God invites you to authorize the lyrics of their powerful CD “All God His Glory” to bless and ignite the sparks of your spirit. Perhaps, you too will find that “All God His Glory” is the message for these end times! Why not listen to them and share their experience. You will be glad you did! Alright ladies!!!!! May God continue to richly bless your work for him! Love you all! !I speak prosperity and favor over your vision and your life!!!! !